With so many biological risks out there - known and unknown, it makes sense to increase your protection in specialized medical environments. 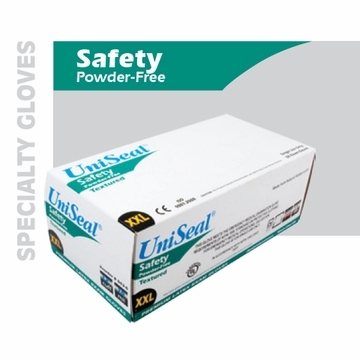 That's why we have developed UniSeal Safety Latex Exam Gloves. They give you a full 10 mil latex barrier against punctures, Rips, and certain chemicals nearly twice as much protect on as regular exam gloves. They feature an extra-long 12" cuff for an additional measure of safety and are fully textured for easier gripping. Uniseal® Safety Exam Gloves. It gives a full 10 mil latex barrier (nearly twice as much protection as regular exam gloves) against punctures, rips, and certain chemicals. They feature an extra-long 12” cuff for an added measure of safety and are fully textured for easy gripping.